What Is the Difference Between Male & Female Red-Tailed Hawks? One of the most common types of hawk found in North America, red-tailed hawks are often seen perching high above open fields on telephone poles or on the highest branches of trees. Both the male and female red-tailed hawk are "buteo"-shaped, which refers to their broad wing span and short head and tail. Factors that distinguish between male and female red-tailed hawks can be found in their build and habits. The most striking difference between male and female red-tailed hawks is that the female is one third larger than the male. According to the website All About Birds, female hawks are large enough that they often are mistaken for eagles, while males do not give off this impression. According to the New York West Side website, the female red-tailed hawk is nearly a pound heavier than the male; full adult females weigh up to three pounds, eight ounces, while males weigh two pounds, eight ounces. Both male and female red-tailed hawks take part in a mating ritual that is unusual and daring. 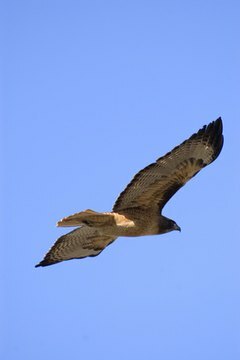 According to "National Geographic," red-tailed hawks are known for their aerial mating, which takes place high above the earth before they plummet to the earth, talons intertwined. Right before the plummet, the male can be spotted by his behavior, which includes long, sweeping dives while the two birds circle each other in the air. Both male and female red tailed hawks take part in the construction of the breeding nest. During the nesting period, the female incubates the egg while the male can be seen hunting for both of them during the month-long incubation period. Feeding and taking care of the young is handled by both the male and the female, who mate for life. In order to keep the eggs fully incubated, the male feeds the female while she sits on the eggs, but according to the website Oregon Zoo.org., males will take over the incubation process if the female dies during the nesting period.